umatic transfer to dvd, FFV1, MOV, quicktime or AVI. With a collection of U-Matic machines including the late model Sony BVU-950 with internal Time Base Corrector we are able to offer preservation quality umatic transfer of all variations and standards of Umatic video tape. This includes, PAL, NTSC and SECAM, Low Band and High Band SP umatic to any digital file format uncompressed of compressed using Quicktime or AVI containers or even DVD. 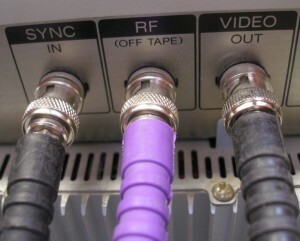 Many Sony U-Matic machines featured a ‘Dub’ connector that can offer a higher quality than composite connection between machines, similar to the y/c connector. We have the correct cables and equipment to utilise this connection. 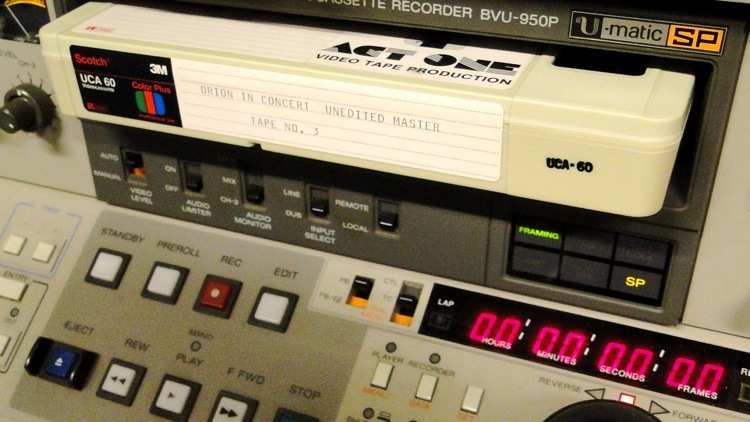 As the U-matic format has been around since the 1970’s many tapes could be over 30 years old. The potential for tape degradation through poor storage and inherent binder problems in some tape stock can cause real problems when attempting to migrate some tapes. As Umatic was a very popular format in schools, colleges and for news gathering large amounts of machines were sold. In 2013 the machines are still to be found but Sony in particular has stopped or run out of many key spares, such as pinch rollers. Keeping a u-matic machine running well will become more and more difficult in the near future. We have a good supply of new spares and service items so are confident we can continue to offer a high quality transfer and restoration service for some time into the future. U-matic is an analogue recording videocassette format first shown by Sony in prototype in October 1969, and introduced to the market in September 1971. It was among the first video formats to contain the videotape inside a cassette, as opposed to the various Reel-to-Reel or open-reel formats of the time. When introduced by Sony they originally intended it to be a videocassette format oriented at the consumer market. This proved to be a failure because of the high manufacturing and retail costs. U-matic was however affordable for industrial and institutional customers, and it became very successful for business communication and educational television. As a result, Sony shifted U-Matic’s marketing to the industrial, professional, and educational sectors. U-matic is no longer used as a mainstream television production format, but it has found lasting appeal as a cheap, well specified, and hard-wearing format. The format permitted many broadcast and non-broadcast institutions to produce television programming on an accessible budget. Four decades after it was developed, the format is still used for the menial tasks of the industry, being more highly specialized and suited to the needs of production staff than the domestic VHS. As time passes it has been replaced at the bottom of the tree of tape-based production formats by Betacam and Betacam SP, as these in turn are replaced by Digital Betacam and HDCAM.